Villanova’s Digital Library recently signed a digital partnership agreement with the Alumni Association of the oldest free Catholic high school still in operation in the city of Philadelphia, Roman Catholic High School. The impressive Gothic building on the northeast corner of Broad and Vine Streets continues to be the main building of the historic school commonly known as Roman. But Roman is not just another private Catholic high school for boys. 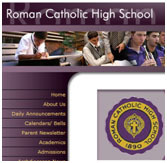 Serving the entire metro area, while still staying close to its roots in the center of the city, Roman Catholic High School has the distinction of being the first free Catholic high school for boys in the United States. The partnership between Roman and Villanova University will allow Falvey to scan rare and fragile documents for the sake of preservation and to promote scholarship on urban Catholic education in Philadelphia at the turn of the last century; including, for example, a printed copy of the founders will, the first year book, and the earliest extant editions of the student newspaper and literary magazine. Known at different times as the Cahill School and Catholic High, it is no longer free, in the sense that it now charges a modest tuition as compared with the other Catholic prep schools in the area, but it continues its proud scholastic and athletic tradition which has produced some of the city’s leading citizens as well as fiercely loyal cohorts of what are affectionately known as “Roman men.” Falvey Memorial Library is now proud to aid Roman in an effort to document and preserve for scholars archival materials held by the Alumni Association at the school related to the school’s founding and it long heritage as a prominent Catholic educational institution.